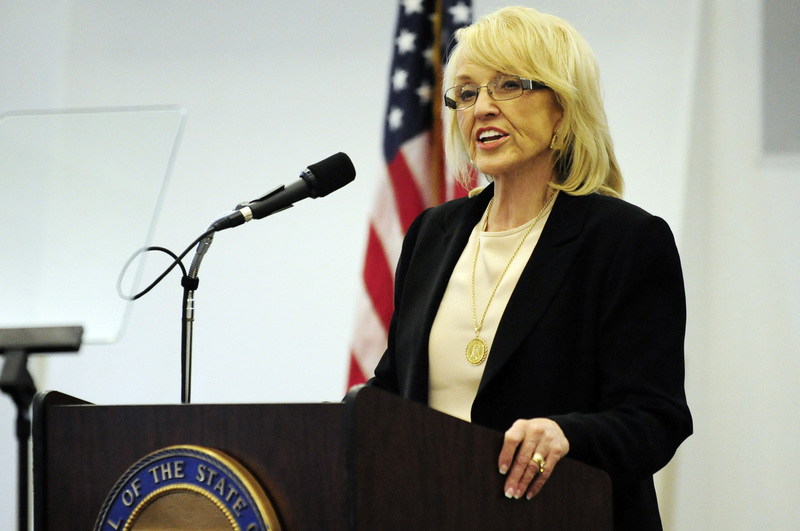 The campus was abuzz January 24 with the news that Arizona Governor Janice K. Brewer was on the Arizona Western College campus to give her State of the State address. Students, faculty and Yuma residents crammed into the south conference room in the 3C Bldg. to hear the Governor's thoughts on the future direction of Arizona and the Yuma area. Everyone had to wait awhile, though, as Brewer gave a private audience to local community leaders and dignitaries before she addressed the public. A standing-room-only crowd listened as Yuma Chamber of Commerce Executive Director Ken Rosevear introduced distinguished guests, included State Senator Don Shooter and the CO of Camp Pendleton in California, Brigadier General Vincent Coglianese. In her address, Gov. Brewer touched on issues such as education, school funding, healthcare and job growth. In all of those areas, the word of the day was "competition." "We have just celebrated all of the achievements of Arizona's first 100 years, and we were reminded of Arizona's five C's -- copper, cattle, cotton, citrus and climate," she said, "and I'm here to tell you that our second century will hinge on another C -- competition." "In the new economy talent is king, creativity is the new capital and competition is worldwide," she said. "If Arizona truly intends to compete, we should study the meaning of the word," she added. "This may surprise you, but the word ëcompete' is of Latin root: it means to strive together." Brewer spoke of a "Great Arizona Comeback," in which the state rose to being ranked 5th in the nation for job growth last year after suffering a $3 billion deficit and the worst housing collapse in state history, which cost Arizona more than 300,000 jobs. On restoring Arizona's competitiveness, Brewer said, "We limited regulations and enacted the largest and the most strategic tax cuts in state history -- very much unlike, by the way, our friends in Washington, D.C. Where they've spent, we've saved." Brewer stressed that the most fundamental and lasting key to Arizona's competitiveness is its schools. "To enable our schools to keep pace with global competition, we're raising standards and increasing accountability for students, schools and teachers," she said. "Everyone knows that global competition for jobs has changed. Our schools must keep pace. "It's not enough to install a new curriculum, raise standards and hope for the best," she added. "I am committed to helping schools and teachers make this transition a success." In addressing the issue, the Governor has proposed the nation's first comprehensive performance-funding plan, meant to reward schools that show concrete improvements. She noted that this plan was not scrapping the current attendance-based funding plan but rather augmenting that system with an innovative approach to promoting school performance. "Together, let's stop simply funding the system we have and start funding the student achievement we want." On the subject of health care, Gov. Brewer asked for the support of the public to expand Arizona's Medicaid program, which will inject $2 billion into our economy and provide health care to hundreds of thousands of low-income Arizonans. Not accepting the federal money, she said, would be "cutting off our nose to spite our face." However, she said that she would put in place a mechanism to shut down the programs funded by the expansion if the federal government reduces those funds for any reason, vowing that "I won't allow Obamacare to become a bait-and-switch." Taking advantage of this federal assistance, she explained, could prevent health-care expenses from eroding core services such as education and thereby improve Arizona's ability to compete in the years ahead. "This problem is not something we can just wish away," she said, "nor can we simply wag our finger at the federal government. Trust me, I tried that once."